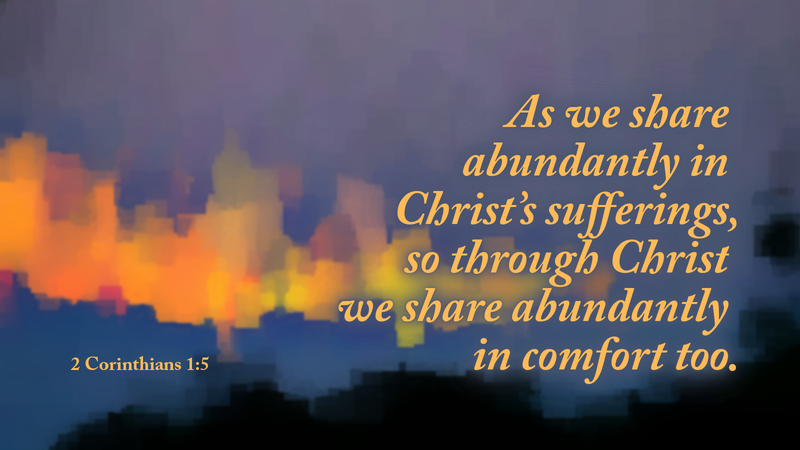 “For as we share abundantly in Christ’s sufferings, so through Christ we share abundantly in comfort too” (2 Cor 1:5). It would be all too easy to think this week about Christ’s sufferings and how, as we walk the path of sorrows, we are sharing in these sufferings. It’s true, of course, that in the history of Christianity, the observance of Holy Week has come to be understood as a way for Christians to participate with Christ in His Passion. But St. Paul reminds us that as we share in Christ’s suffering, so too through Christ do we share abundantly in comfort. And, of course, Paul is not thinking only about Holy Week; he is considering all of the ways that we share in Christ’s suffering. As we suffer persecution, hatred, pain, illness, loss and death, we are sharing abundantly in Jesus’ suffering. Christians have long understood our pain and grief to be a participation in that of Jesus—especially His humiliation, torture and crucifixion. However, St. Paul reminds us that as Christians we share more than Christ’s suffering; we share in His comfort as well. As we are one with Christ Jesus, we are one with Him in His death, yes, but also we are united with Him in His resurrection! Although we suffer in life, we also receive comfort through Jesus’ resurrection and new life. And what a comfort that is! Death is not final. Life will not end for us, no matter how great our suffering, pain and grief. We will rise again, with Jesus, the first-fruit of the dead. And this comfort is not just for us, but to be shared with others. Paul writes, “Blessed be the God and Father of our Lord Jesus Christ, the Father of mercies and God of all comfort, who comforts us in all our affliction, so that we may be able to comfort those who are in any affliction, with the comfort we ourselves have received from God.” Let us rejoice in the comfort and consolation we have received, but let us offer that to others—that they too may know of the hope we have in Christ Jesus!